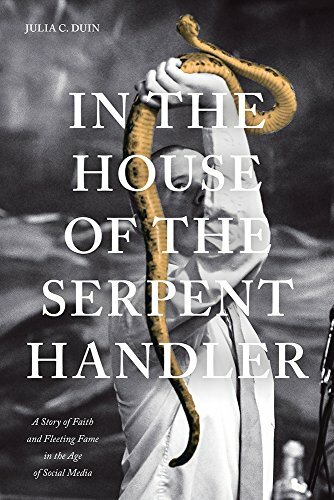 In the House of the Serpent Handler offers an intimate and engrossing look at the latest generation of Pentecostal believers who “take up” venomous snakes as a test of their religious faith. Focusing on several preachers and their families in six Appalachian states, journalist Julia C. Duin explores the impact that such twenty-first-century phenomena as social media and “reality television” have had on rituals long practiced in obscurity. As Duin reveals, the mortal snakebite suffered by pastor Mack Wofford in 2012 marked the passing of the torch to younger preachers Jamie Coots and Andrew Hamblin, who were featured in the 2013 series Snake Salvation on the National Geographic Channel. Seeing their participation in the show as a way of publicizing their faith and thus winning converts, Coots and Hamblin attempted to reinvent the snake-handling tradition for a modern audience. The use of the internet, particularly Facebook, became another key part of their strategy to spread their particular brand of Christianity. However, Coots’s own death in 2014 was widely reported after the TV series was canceled, while Hamblin, who emerges as the central figure in the book, was arrested and tried after a shooting incident involving his estranged wife. His hopes of becoming a serpent-handling superstar seemingly dashed, Hamblin spent several months in prison, emerging more determined than ever to keep to the faith. By the end of the narrative, he has begun a new church where he can pass on the tradition to yet another generation. Duin’s thorough, sympathetic reporting and lively style bring the ecstatic church services she witnessed vividly to life, and through interviews and quotations from the principals’ Facebook postings, she has allowed them to express their beliefs and reveal their everyday lives in their own words. She also gives the reader an up-close view of how a reporter pursues a story and the various difficulties encountered along the way. These engrossing elements add up to a unique story of the ways in which the practitioners of a century-old custom—one that strikes most outsiders as bizarre—are adjusting to the challenges of the new millennium. She lives in the Seattle area. If you have any questions about this product by Univ Tennessee Press, contact us by completing and submitting the form below. If you are looking for a specif part number, please include it with your message.